The football field is a place where some of the greatest sports stories of all time take place. Your favorite team has plenty of its own tales of athletic accomplishment and incredible comebacks. From star quarterbacks to hard-nosed, hard-hitting linemen, players throughout the history of the game have gone from nobodies to hall of famers. 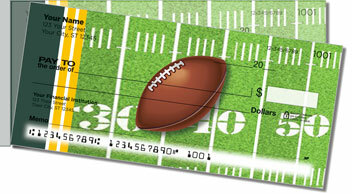 Green & Gold Football Side Tear Checks celebrate the great American tradition of pigskin and display the colors of the team you cheer for every week. 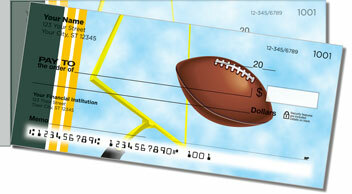 You'll love the way these checks can be removed from the checkbook without any unintentional rips or wrinkles. 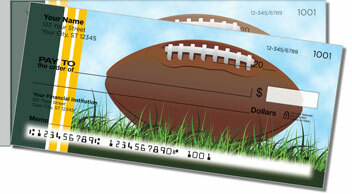 Get your very own Green & Gold Football Checks right now! 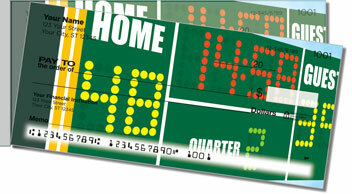 You can also order matching return address labels.